Welcome! If you’re serious about music production, but you’re not currently sitting in your dream studio, I’d like to offer to design it for you. A great studio will help you stand out from the crowd, take your production quality to the next level, and impress your clients. This page will show you how we can determine your needs, establish your studio design goals, and turn them into blueprints for your dream studio. In case we’ve not yet met, my name is Tim Perry and my mission is to harmonize leading edge recording studio design with eco-friendly acoustic design. I studied acoustics and audio production at the University of Victoria while majoring in electrical engineering, and I’ve been doing research and design in recording studio acoustics for 7 years. If you’re planning to build a studio in the future, you can send me your requirements and get a free design estimate by clicking the blue button in the sidebar. If your studio is already built but you wish to optimize the acoustics, I also offer a room treatment consulting service. 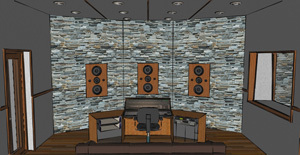 Recording studios are my specialty, but because every studio is unique I’m a versatile designer who can design a wide variety of music rooms to spec, including post production studios, mastering studios, listening rooms, home theaters, mixing rooms, rehearsal studios, isolation booths, vocal booths, and of course live tracking rooms and control rooms. 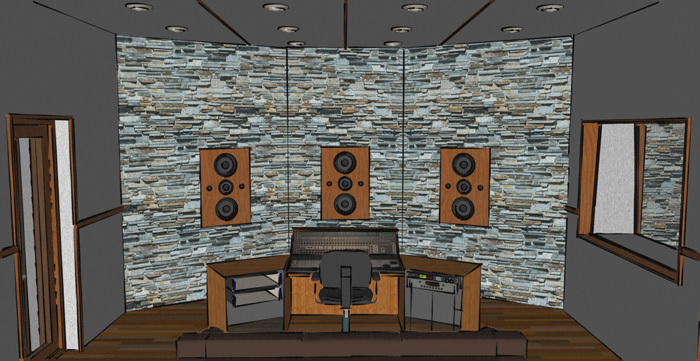 The expected cost of designing a recording studio is typically in the range of $15 – $50 per square foot. This does not include the cost of any required permits and structural engineering. Other factors that may increase the cost include HVAC system design, electrical design and architectural design. I can only take on two clients at a time. Ideally you will be based in the USA or Canada (I live in Victoria, BC); however, I design for clients internationally, using both metric and imperial standards. Where necessary, we will work with a local architect and engineers to ensure your studio is compliant with local codes and standards. The design process consists of five phases. Having multiple phases helps keep the project focussed, organized, compliant with construction codes, and minimizes risk. It helps us narrow in on the best design before committing time and money to the details. At the beginning of each phase I’ll give you a proposal, which you can either accept or decline. 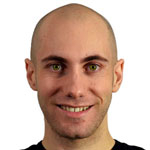 During each phase I will send you progress updates and obtain frequent feedback from you. At the end of each phase I’ll present you with deliverables for your approval. We’ll discuss the project goals and define the functional requirements and projected budget. With your input, I’ll determine the size of each room needed to meet usage requirements (e.g., required working space for occupants and gear) and acoustical objectives. I’ll also carefully consider which modern recording studio design best practices are best suited to your specific needs, and explore these options with you1. 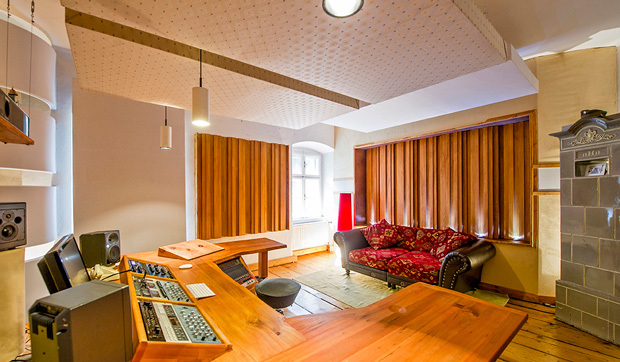 1For example, depending on your music studio requirements I may recommend one of the following design criteria for your control room: NE (Non-Environment), RFZ (Reflection Free Zone), LEDE (Live-End, Dead-End), ESS (Early Sound Scattering) or Ambechoic. An organized, bullet pointed list of requirements and design objectives. 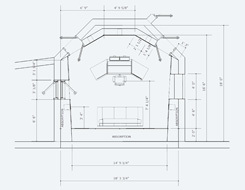 Once we’ve defined the requirements, I’ll create preliminary studio plans and present them to you for feedback. We’ll discuss the drawings and revise them to your satisfaction. These drawings will give you the opportunity to verify that I have correctly interpreted your desires and requirements. 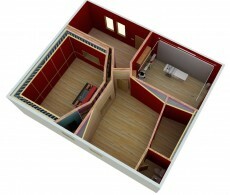 Throughout Phase 1, I’ll send you schematic floor plans and 3D images of the rooms. 2D schematic floor plan, 3D Sketchup model of the interior, room visualizations (conceptual illustrations, rendered illustrations). 2D floor plan / room layouts: Considering your requirements and the space available, I’ll determine the optimal shape and layout of the rooms, and I’ll illustrate how they fit together in a floor plan of your studio. 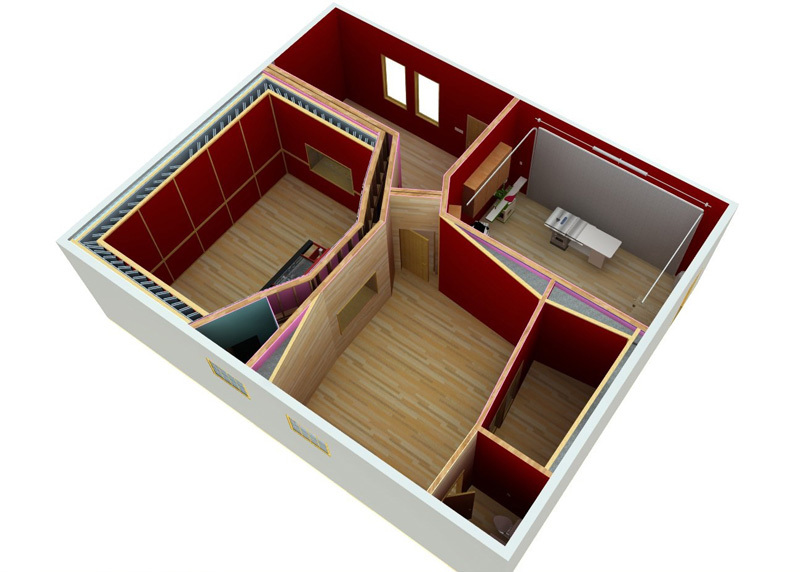 3D conceptual model of the interior: Since it’s important for you to be able to visualize the design before committing to details, I’ll provide you with 3D visualizations of the room layouts. This will help you understand what it will feel like to work in each room. Here we will check that everything is up to code and refine the design as needed. We will develop the approved schematic design layout into a set of drawings that illustrate how the studio would look when constructed. We may also conduct feasibility and construction cost analysis. Floor plans, elevations, sections, site plan, 3D Sketchup model of the full studio, room visualizations (rendered illustrations and animations). 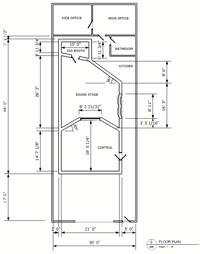 After you have approved of the concept design, we will produce the detailed blueprints needed for construction. Where necessary we will collaborate with local architects and engineers to produce this complete set of working drawings. Once the design is complete, we can help you find a qualified contractor so that your studio will be built as specified in the construction drawings. Recording facilities have special requirements that contractors may not be familiar with, so we will check in with you during the construction process to make sure everything is going smoothly. If you wish to supervise the construction yourself, we will provide you with a check-list of considerations that your contractor may overlook. 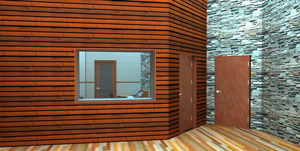 Recording studios present special challenges to sustainable development. 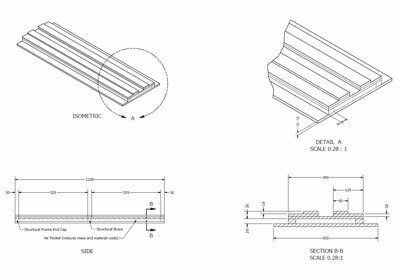 Acoustical requirements may conflict with common green building practices, placing constraints on structural form, building materials, passive heating, ventilation and natural lighting. I embrace this challenge by setting green goals for all studio design projects. Over the past 5 years I’ve focused on finding cost effective, eco-friendly solutions to recording studio construction without compromising performance. 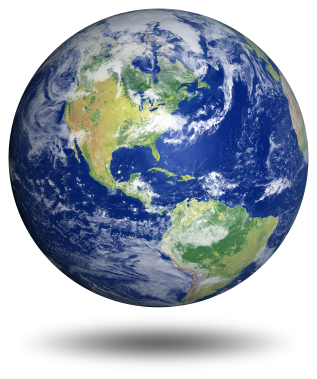 Wherever viable, I will specify construction materials that are recycled, natural, abundant or renewable. In special cases where a green building practice is inferior to a traditional practice, I will tell you, and we will choose the solution that best meets your needs. I’m the wrong recording studio designer for you if you don’t care about the environmental footprint of your studio. But, if you’re interested in how having a green recording studio can help you save costs in the long run (and help you stand out from your competitors), you’ve come to the right place. I believe that sustainable design is good design, and a well designed studio will benefit you for years to come. What do you really want when it comes to your studio? To start your free initial consultation, click the blue button below. You’ll be taken to a form with a few questions about your studio requirements and aspirations. Fill out the form, and I’ll get back to you! If your studio is already built but you wish to improve the acoustics, Tim also offers room treatment consulting.